Filter belts for belt presses are very strong and resistant to abrasion. They have high dimensional stability during machine load and their edges are reinforced. 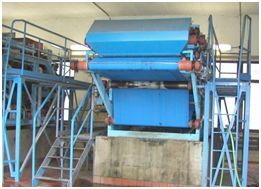 Construction of filter belts ensures good drainage of liquid and at the same time prevents the extrusion of the sludge cake through the fabric. Individual fabric designs differ in the speed of dewatering, size and shape of apertures, surface smoothness, cleanibility, wear resistance, fabric stiffness and mechanical stability, etc. Belts are joined by stainless steel clipper seam or by pin seam, which are dismountable. Alternatively belts could be endless without dismountable seam. Belt edges are standardly reinforced by strip of high mechanically resistant and flexible two component glue. Triangle reinforcement at seam edges increases mechanical resistance of seam. 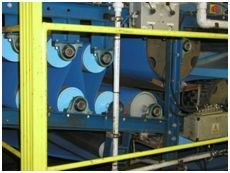 Filter belts for belt presses are usually made of abrasive resistant polyester and polyamide. FiltraPress SW is the most widely used filter fabric suitable for a wide range of industrial applications, including the sludge dewatering in sewage plants. We offer several fabric versions for different types of sludge. Made of PET and PAD yarns with large diameters, FiltraPressis highly resistant to abrasion. It is suitable for dewatering of sludge containing hard abrasive particles, especially in the mining industry.